Hasta utthanasana is the second and the 11th step of the sun salutation series of asanas. 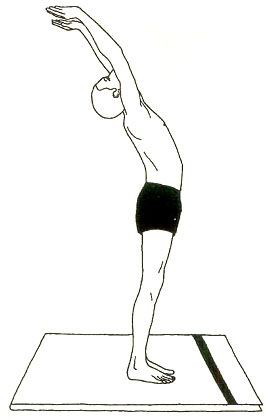 Position: Raise and extend both arms over the head. Keep the arms isolated, bear width separated. Twist the head, arms and upper trunk in reverse. Breathing: Inhale while raising the arms. Mindfulness: Physical – on the extend of the belly and development of the lungs. Spiritual – on vishuddhi chakra. Mantra (Optional): Om Ravaye Namaha, greetings to the sparkling one. Benefits: This pose extends all the stomach organs and enhances digestion. It helps in toning the arm and shoulder muscles, conditions the spinal nerves, opens the lungs and expels overabundance weight. It extends and conditions the muscles of the guts. It grows the mid-section and the rib confine bringing about a full admission of oxygen. It helps in using the lung limit to its full capacity.